Jean Arthur's smart, sassy brittleness may be an acquired taste, but to her fans she can brighten up any comedy - including this one, which has a touch of Frank Capra in its theme. Arthur plays a shopgirl who suddenly comes face to face with the big boss, tycoon Charles Coburn, when he decides to pose as an employee. The cast members put in polished performances, with leading man Robert Cummings the only disappointment. 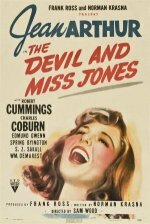 Comedy starring Jean Arthur and Robert Cummings. A millionaire decides to pose as an employee in one of his own department stores to investigate complaints by the staff.